Secure a Munich holiday package on Expedia today! This is by far one of the simplest ways of saving cash and time for your incredible holiday. Book your package today on Expedia and gain savings of up to 15%*! It's really that simple! With more than 400 partner airlines and 321,000 worldwide properties available to you on our international database, you'll be heading off on your holiday in no time! Itinerary looking a little thin? Munich holiday all arranged but not sure what to expect when you arrive? Let us make it easy. Do yourself a favor. Don't go home without having a look at English Garden and Marienplatz. You're sure to have an unforgettable time wandering around these famous sights. There's no need to worry about a boring moment in this animated city. Hofbrauhaus and Olympic Park will make sure you're always on the move. Church of Our Lady and the Deutsches Museum are just a few more worthwhile attractions that'll capture your imagination. Try to envisage the tales hidden in the walls of Nymphenburg Palace as you look up at its gorgeous facade. There's a great range of things to do in this destination. Money burning a hole in your pocket? Look for unique keepsakes and snap up some superb deals at Viktualienmarkt. Still got time on your hands? Stroll through exhibits that illustrate and celebrate the history of transport at BMW World. An impressive record of the evolution of transportation, it houses a range of vehicles and machines of yesteryear. Would you like to create some unforgettable memories? A holiday is the ideal time to have some cool new experiences. If you'd rather take a look at all the activities on offer, go to our Munich things to do page. Mark accommodations for Munich off your travel agenda when you choose a room on Expedia. With no less than 356 properties available, it won't take much time to get your cheap holiday or luxury getaway off to a flying start. Discerning travellers with a taste for the good life will feel right at home at the Mandarin Oriental München (Neuturmstr. 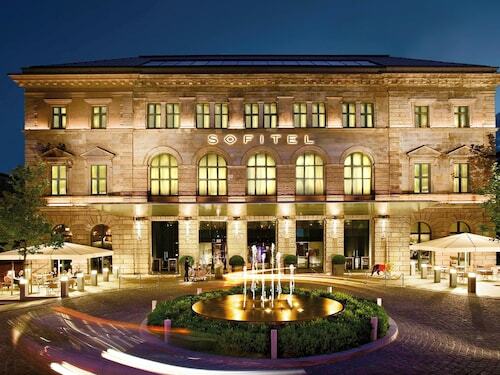 1) and the Hotel Bayerischer Hof (Promenadeplatz 2-6). Searching for something a little lower priced? 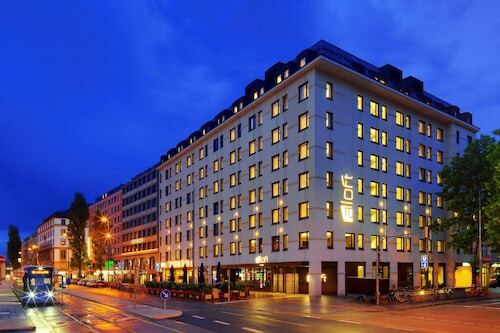 The Hotel Koenigshof (Karlsplatz 25) and the Aparthotel Adagio Muenchen City (Schwanthalerstr. 61) are a couple of options that won't cost you a fortune. A highlight of any visit to Munich is English Garden. 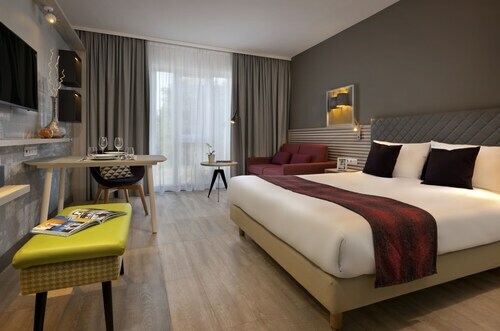 If you're eager to stay close to this world-famous attraction, the Hilton Munich Park and the Golden Leaf Parkhotel Im Lehel are both worth checking out. The airport probably isn't going to be the highlight of your getaway, but there's nothing like the thrill of knowing that your well-deserved trip to Munich is just a plane trip away! Once you disembark at Oberpfaffenhofen Airport (OBF), you'll be 12 miles (19 km) from the heart of town. Located in Erding District, this luxury hotel is within 9 miles (15 km) of Freising Cathedral, Weihenstephaner Perennial Gardens and Erdinger Weissbrau Brewery. Erding Thermal Spa and Weihenstephan Brewery are also within 12 miles (20 km). Munich Airport Terminal S-Bahn and Munich Airport S-Bahn are within a 5-minute walk. Located in Munich City Centre, this luxury hotel is within 1 mi (2 km) of Marienplatz, Pinakothek der Moderne and Hofbrauhaus. Residenz and Deutsches Museum are also within 2 mi (3 km). Central U-Bahn and Munich Central Station are within a 5-minute walk. This family-friendly Munich hotel is located in the business district, within 1 mi (2 km) of Church of Our Lady (Frauenkirche), Old Pinakothek and Town Hall of Marienplatz. New Pinakothek and National Theater Munich are also within 1 mi (2 km). Central U-Bahn and Munich Central Station are within a 5-minute walk. Located in Neuhausen - Nymphenburg, this hotel is within 1 mi (2 km) of Augustiner Keller and Theresienwiese. Marienplatz and Karlsplatz - Stachus are also within 2 miles (3 km). Hackerbrücke S-Bahn is 10 minutes by foot and Donnersbergerbrücke Station is 10 minutes. Located in Freising District, this hotel is within 6 miles (10 km) of Freising Cathedral, Weihenstephaner Perennial Gardens and Weihenstephan Brewery. Erding Thermal Spa and Erdinger Weissbrau Brewery are also within 12 miles (20 km). Besucherpark S-Bahn is 7 minutes by foot. Located in Munich City Centre, this aparthotel is within 1 mi (2 km) of Augustiner Keller and Theresienwiese. Marienplatz and Karlsplatz - Stachus are also within 2 miles (3 km). Hackerbrücke S-Bahn is 8 minutes by foot and Donnersbergerbrücke Station is 10 minutes. 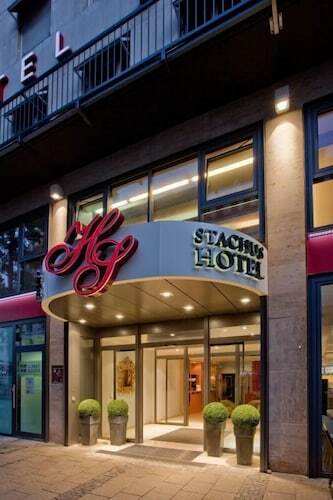 Located in Munich City Centre, this hotel is within a 15-minute walk of Karlsplatz - Stachus, Church of Our Lady (Frauenkirche) and Marienplatz. Hofbrauhaus is 0.9 mi (1.5 km) away. Central U-Bahn and Karlsplatz (Stachus) Station are within a 5-minute walk. Located in Munich City Centre, this hotel is within 1 mi (2 km) of Karlsplatz - Stachus, Church of Our Lady (Frauenkirche) and Asamkirche. Marienplatz is 0.9 mi (1.4 km) away. Central U-Bahn and Munich Central Station are within a 5-minute walk.